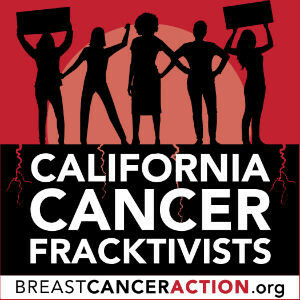 The movement to end fracking and other forms of extreme extraction in California is heating up bigtime, and we want you to become a California Cancer Fracktivist to get more involved in our work to ban these toxic processes in the Golden State. The danger that fracking poses to our health is dire. In just the last year, reports uncovered that fracking corporations in California are dumping wastewater into our drinking water aquifers as well as using it to irrigate our food. And as I write this email to you, thousands of residents in the LA neighborhood of Porter Ranch are evacuating their homes because a huge leak of fracked gas is causing short-term illnesses like rashes and nosebleeds, and could also cause long-term health effects like cancer. But the good news is we’re part of a statewide, anti-fracking effort that’s growing stronger by the day. We’ve been raising the alarm about the health harms of fracking for years. Now we’re calling on our members who care about the connection between fracking and cancer to step up their involvement in the anti-fracking movement here in California. If this sounds like you, sign up to become a California Cancer Fracktivist today. When you sign up, we’ll send you local and statewide opportunities to get involved and give you the materials you need to oppose fracking on the frontlines. You’ll be part of a pivotal movement that is paving the way to ban fracking across the country—as they say, so goes California, so goes the nation. Take a stand for the health of your community by signing up now.